This art and cultural project was produced as part of an international invited design competition. 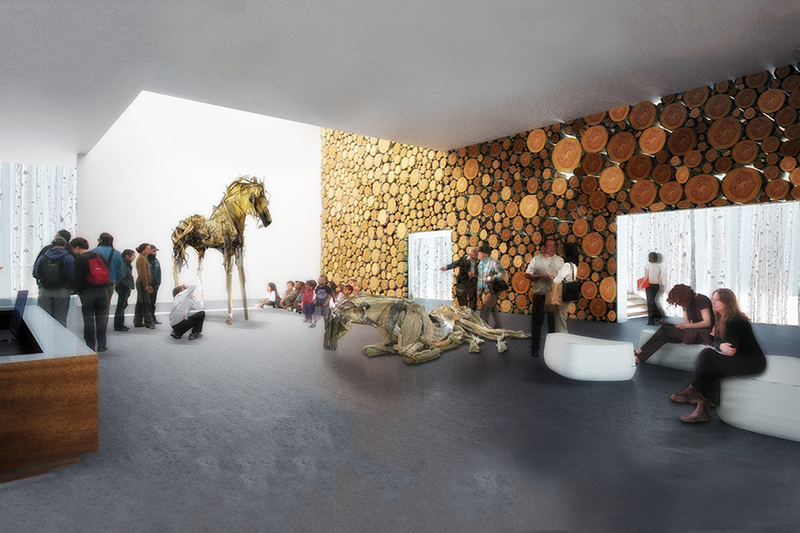 Architects from around the world were considered and Sparano + Mooney Architecture was selected as a finalist to produce a design concept for the 30,000 SF Kimball Art Center museum, event and art education center in Park City, Utah. The design for the transformation of the Kimball Art Center is inspired by the aspen tree growing in the Wasatch mountain range and by the museum and art education center’s mission to serve as the heart of Park City’s creative community. The incredible diversity and reach of the roots of this remarkable tree - the oldest (80,000 years old) and largest (6,600 tons) living organism on our planet – evoke the history and potential reach of the Kimball Art Center network. The design is rooted in the Kimball Art Center’s history and will serve future generations with a heightened awareness of sustainable design, energy production and consumption, and environmental conditions unique to the Mountain West. The tree metaphor provided the diagram for the project, whereby the roots of the tree serve as a thriving underground foundation from which the program spaces grow above. Surrounding the activity is the tree canopy, an etched, triple-glazed screen forming a dynamic circulation space filtering daylight in while also producing energy for the building. The screen embodies transformation through its ability to change dramatically from day to night and offers changing seasonal views of the mountains and activity on the street. The idealized western vernacular log architecture is present in the project with the central volume’s form, evoking the memory of a cabin in the aspen woods. The space is brought to life with the graphic texture of trees killed by bark beetles, salvaged in Utah's Wasatch mountain area. The museum architects planned and programmed the expansion to consider future growth and art acquisitions with a comprehensive facility needs assessment that grounded the design. Art and architecture merge in the design as the gallery spaces offer distinct environments for display of contemporary art while also providing event space for fund-raising and cultural programs for Park City and beyond. The design has been featured in a series of international publications and has won design awards, including the Jury Prize for the Design Arts Utah competition, and was selected as one of the top designs produced in the last decade by a Utah architecture and design firm.